tastyworks vs thinkorswim is a battle of specialty options trading platforms beginning with the lower-case letter ‘t’ – which may not be a coincidence because the two platforms were founded by similar executive teams. The similarities don’t end there; both support fast and accurate order execution, low commissions costs, world class technology, and an extensive suite of tools. thinkorswim has a head-start of almost two decades on tastyworks, but when comparing the respective trading platforms, tastyworks stands toe-to-toe on many dimensions. tastyworks rises head and shoulder above industry peers when it comes to content thanks to its live video broadcast station. thinkorswim beats the pack when it comes to tools, simulators, analyzers, and back-testing features. If you want a souped-up options trading platform, you won’t go wrong with either thinkorswim or tastyworks, but which one is best? Which Trading Platform Is Best: thinkorswim or tastyworks? Both thinkorswim and tastyworks are specialty options trading platforms created by traders for traders. You can trade stocks, options, futures and ETFs on both platforms but if you also want forex, thinkorswim is best. tastyworks has the edge when it comes to accessibility. While downloadable desktop and mobile platforms are supported by both, tastyworks also provides a web-based interface that is as powerful as its desktop version. thinkorswim still has the edge on tools but the tastyworks trading platform is still comparatively new and what is currently available is just the tip of the iceberg of what is likely to come if the history of what the team built at thinkorswim is anything to go by. tastyworks has an innovative pricing model that imposes no commissions charge on all closing trades. Stock and options trades are slightly cheaper at tastyworks while opening futures trades are slightly cheaper at thinkorswim. Amid fierce competition on fees, tastyworks has fired a shot across the bow to its rivals by charging no commissions on closing trades. Clearing fees, which tastyworks has no control over, still apply. thinkorswim fees are highly competitive too but tastyworks has the edge with its innovative pricing model on closing trades. Unlike tastyworks, thinkorswim also supports buying and selling of mutual funds. You won’t be charged for transacting NTF (no-transaction-fee) or Load funds but a charge of $49.99 applies to no-load mutual funds. tastyworks and thinkorswim support virtually any options trading strategy you can dream up, and feature portfolio margin if you want to goose your returns but beware that risks increase too when you use portfolio margin leverage. Both tastyworks and thinkorswim understand options trading risks well, so almost any combination of strike prices, contract numbers, and expiration months can be supported as long as you can cover the risks. Both support trading on portfolio margin, which amplifies both gains and losses. tastyworks and thinkorswim have extensive tools to help you make better trading decisions. 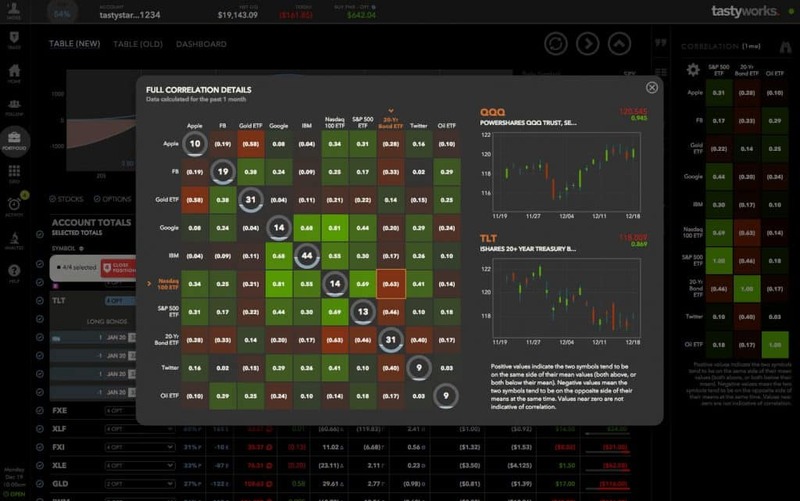 With its head-start, thinkorswim has a larger array of powerful tools than tastyworks, which offers its own suite of innovative dashboard selections. tastyworks and thinkorswim are both intended for self-directed, fee-conscious traders, and that means you get access to a dizzying array of tools to help you make better trading decisions. 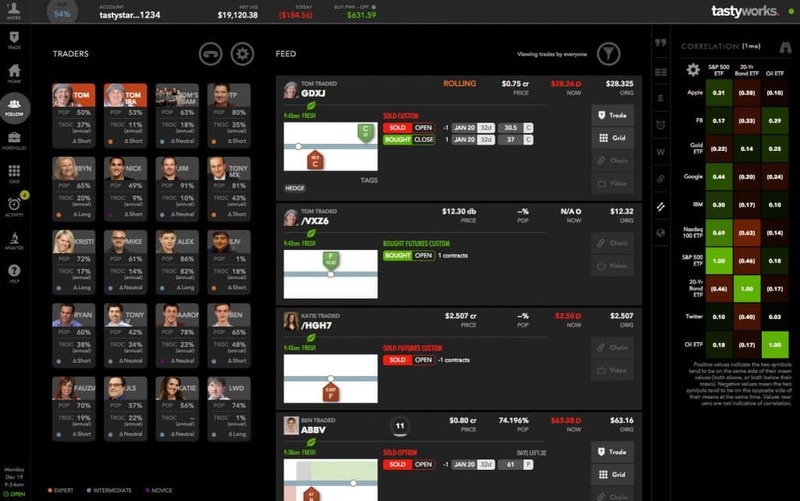 At tastyworks, the dashboard is easy to read and features Portfolio, Analyze, and Trade tabs. You also have access to a feature called Follow on the web-based version, which is a curated flow of stock market ideas from experts. If you are new to options trading or stock market trading in general, the Follow feature is especially valuable to see how top options traders are trading. And if you are an experienced trader, it is helpful as a discovery tool to spot new trade ideas. A bonus is that you will see tastyworks team members, such as the renowned Tom Sosnoff, feature in the Follow section. If you want to vet trading ideas of your own, the Analyze tab is the place to go on your web-based dashboard. Before placing an options trade, you get to see what your unrealized gain or loss would be at expiration when time-decay has eroded all time value from options. Realized gain calculations, fees, and duration are all displayed intuitively too. Another gem you will find on the tastyworks platform is the Correlation Matrix. Let’s say you wanted to see how much Apple moved when Google or Twitter moved by a certain amount. Or if you wanted to know how much the S&P 500 moved relative to a Gold ETF or a 20-year Bond, you could easily track those correlations. View platform on many devices When you customize your platform settings on one device, those preferences carry over to other devices. In-app chat & sharing You can send live texts to trading specialists within the thinkorswim mobile app and even share your screen to get immediate assistance. Customer alerts When certain price and/or technical levels are triggered, you can set notifications so you can act quickly. Get social sentiment insights You can view how the sentiment for a stock changes over time to see when stocks reach bullish and bearish extremes. thinkorswim is about as close as any retail trader will get to a professional level platform without having to pay pro-level fees. Unlike some other platforms, thinkorswim has no data fees or hidden fees, so what you see is what you get. Commissions and clearing fees are still par for the course. thinkorswim has so many simulators, analyzers and discovery tools that even the most adventurous trader will be spoiled for choice. While the selection of tools is extensive, it may seem overwhelming to beginners but hang in there because it is worth the effort when you stumble upon a valuable new tool that helps you make better trading decisions. Feature-rich charts with over 300 technical studies. Fast Beta, a proprietary TD Ameritrade technical study that weights recent price data more heavily. thinkScript, an embedded programming language to manipulate existing charts and technical studies. Screening and scanning tools to discover stocks and options that meet certain criteria. Pairs trading where you buy one security and sell another simultaneously. Strategy Roller for covered call traders to automatically roll forward call options on stocks you want to hold for longer time periods. Overall, thinkorswim has more bells and whistles than tastyworks so if tools are your top priority then thinkorswim is the winner but if cost is your primary concern then tastyworks is the place to go. 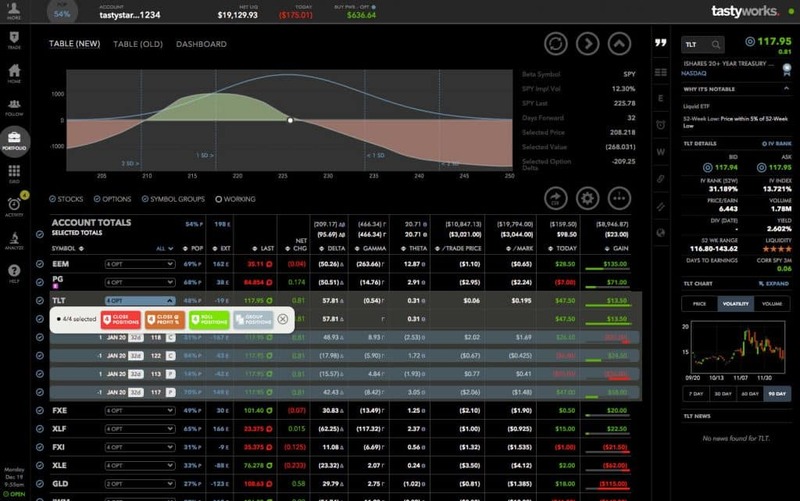 ✅ Tools, Simulators, Analyzers: thinkorswim has a dizzying array of technology-powered tools to simulate, test, analyze, and discover new trades. The technical charts are exceptional and customizable, and you can even manipulate them using thinkScript, an embedded programming language. ✅ Commissions and Fees: tastyworks has the edge on commissions by charging zero commissions on all closing trades (clearing fees still apply). ✅ Forex, Bonds & Mutual Funds: TD Ameritrade which owns thinkorswim offers not only stocks, options, ETFs and futures, but also forex, bonds and mutual funds. ✅ Customer Support: Customer support is in the DNA of the team at tastyworks. So much so that the c0-CEO has claimed to spend quite a bit of time on the customer support desk so he has a pulse on customer issues. ✅ Account Types: If your financial circumstances are more complex, thinkorswim caters to a broader range of account types. tastyworks supports taxable accounts, traditional IRA and Roth IRA accounts as well as international accounts. ✅ Navigability & Access: thinkorswim loses points for having no login area when you visit its website. It’s confusing to discover that you must download a desktop version of thinkorswim. tastyworks by contrast has a web-based interface as well as a downloadable desktop version and a mobile app. Comparing thinkorswim and tastyworks is a little like comparing two fine wines – they are both excellent, and you can’t go wrong with either as an options trader. 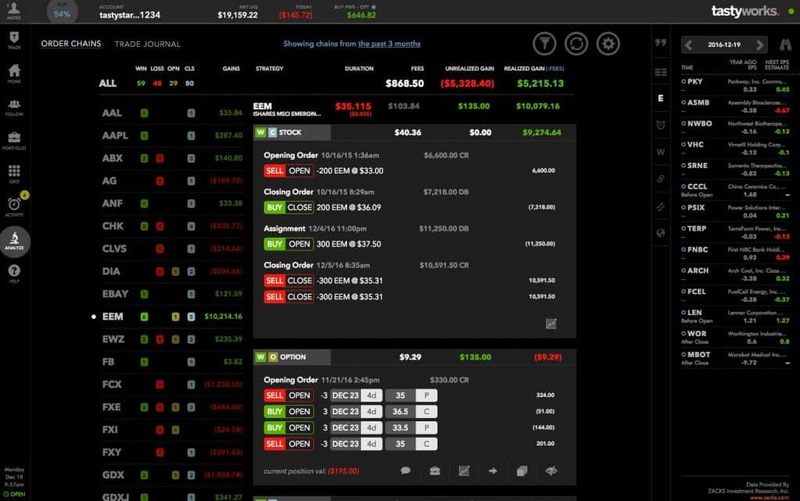 With that said, thinkorswim will best suit experienced traders who rely on tools and professional level analysis with extensive scanning, screening, and analysis capabilities. Frequent stock and options traders who are price sensitive should take a serious look at tastyworks because no commissions on all closing trades can add up to some serious savings. ‹ Is LOLA The Best Organic Tampons Brand?